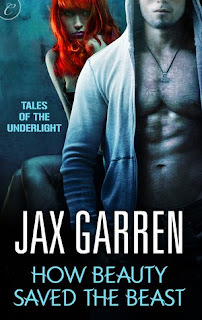 Amid the many adaptations of Beauty and the Beast comes Jax Garren's Tales of the Underlight. A series with an undeniably mystical quality that it may just become your favorite fairy tale retelling! 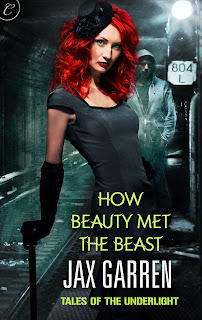 Jax Garren debuted in 2012 with How Beauty Met the Beast and will be following up with How Beauty Saved the Beast, this February, and How Beauty Loved the Beast later in 2013. I'm so honored to interview Jax about the Underlight series and what readers can expect from this blossoming author! Can you tell us something about yourself that hasn't been discovered by readers, yet? What memories of your recent debut stand out to you? The fall of 2012 was nuts. In addition to the book release (November) and writing the final novel in the series (I finished in September), back in July my husband and I started fostering two girls, ages four and seven. Hopefully we’ll find out this month that we can adopt them! But it’s been a truly wild and life-changing few months. I think all the usual author things about a debut release stand out to me— seeing the book on Amazon for the first time, getting reviews, getting my first note from a stranger telling me she liked it (I can’t express how amazing that feels). But my favorite moment requires a little backstory. One of the things about fostering children is that they are often very needy. Our girls have lived in so many homes with so many strangers over the last couple years that they are understandably insecure about having somebody there for them when needed. So they want to be around my husband and me constantly. This is tough when you’ve got a job. As long as they’re quiet, I let them do art projects by my desk. That way they can have a parent with them, and I can still work. At first, getting them to disengage from me enough that I could work—No, you can’t sit on my lap while I type. No, I can’t play a game/Barbies/read a book while I write. Yes, it does take this long. Please don’t stand six inches away and stare at me; even if you’re quiet, I can’t work with you breathing on me—was a real challenge. I spent a lot of time talking to them, especially the oldest, about the importance of hard work and striving to accomplish your dreams. I told them about how I’ve wanted to be a writer since I was a little girl and how much it means to me to get the opportunity to be published—so I need to keep working on the next book so that I can keep my dream. I wasn’t sure how much of this soaked in until the release day. Apparently I’d made an impression. In addition to several congratulations out of the blue from both of them, the older girl’s art project that day was to make her own book—colored drawings, stapled together and everything—in honor of me accomplishing my dream. I almost cried it was so sweet. How Beauty Met the Beast is my favorite retelling of the classic fairy tale, Beauty and the Beast. Did you set out to write a retelling or did the idea of Jolie and Hauk's story come first? Thanks, Candace! It was a bit of two different ideas smashed together. The original inspiration for the story came as my sister and I were watching reruns of that old CBS Beauty and the Beast with Ron Perlman and Linda Hamilton. I love the premise and the underground community, but it also has a lot of cheesy 80s sort of things about it. Plus as awesome as Ron Perlman was as Vincent (the beast), I was always a little weirded out by the unexplained lionesque look he had. They call him a “mythic, noble man-beast” in the advertising copy, but my sister and I call him the Manimal. We were inventing cocktails (a strawberry/mint/vodka/club soda mix won the evening) while we watched and got to talking about how things might be different if the series was done now. This was a couple years ago before I’d heard that the CW was rebooting it, but their inspiration went in a really different direction than mine. The timing worked out nicely, though, to have them both out at once! The other idea I’d had was a long-held desire to write a phoenix story. I’ve always loved the idea of rising from the ashes and had started pondering how to make a human one. The ideas of a beast and a phoenix merged into a scarred soldier. Both a phoenix and Beauty and the Beast are about transformation, and so it felt right. Hauk became both, somebody who was burned so badly he should’ve died and then reinvented his life. The phoenix tattoo on his skull is my in-book representation of that inspiration for his character. Can you tell us more about what can be expected in the series and what's in store after How Beauty Met the Beast? Right now I’m on contract is for three books, and Jolie and Hauk’s story will have its finale in book three. In the second book, How Beauty Saved the Beast, we learn more about the fire that scarred Hauk—and about his rages. Jolie gets confused about her feelings for him, something that’s only intensified by the appearance of an old girlfriend who knew Hauk before the fire. Also, Ananke has stepped up their game with a new, powerful weapon, and this time they’re after Hauk. Book 3, How Beauty Loved the Beast, picks up a couple weeks after Book 2 finishes, and I don’t want to give too much away! But of all three, it’s the sexiest and the scariest and was the hardest to write by a long shot! If the series continues after the trilogy, it’ll be with a different hero and heroine pair from the Underlight (possibly Brayden and somebody we meet in book 2), but that hasn’t been decided yet! I was absolutely amazed at how much is covered and how well the characters are portrayed in this story, since it's novella length. Do you think the length of the story will impact how readers approach it or view it after reading? Aw, you’re really sweet! The length has been one of the most contentious things about the first book. I love novellas. I have a busy life and can only read in small chunks, usually at night before I go to bed. Novellas let me feel like I’m accomplishing something. So because I love them, it makes sense to my brain to break down stories that way. One of the things I love about digital publishing is that financial considerations no longer determine what page count publishers will accept. In the past, the word count of an average book was narrowly limited because, due to the cost of things like binding, storing and shipping, physical books sell for about the same amount of money regardless of how long they are. But as a consumer, nobody wants to pay $7 for a 150 page book when they could also pay $7 for a 350 page book—hence you almost never see short stories or novellas printed and sold as individual titles. But in the digital market, a publisher can make money selling a 150 page book for $2 and a 250 page book for $4, and suddenly it becomes feasible for publishers to acquire and sell stories of any length. Not being shoehorned into a particular word count is very freeing as a writer! While on this topic I did want to note that the Beauty and the Beast trilogy isn’t one novel-length story cut into thirds. Each story gets significantly longer—the first one, How Beauty Met the Beast, is 38K words (just over 100 pages), How Beauty Saved the Beast is 52K words (just under 200 pages) and How Beauty Loved the Beast is over 70K words (I’m not sure what that page count will work out to). Most full length novels are 90K-110K, so with a trilogy total word count of over 160,000 words, put together they would make a staggeringly huge debut work. If there was one thing, a lesson or value, you could get your readers to take away from your story, what would it be and why? If you’re interested in what I was thinking about as I wrote, though, it was the assumptions we make about other people. What’s beautiful rich girl like? A scarred veteran? A drag queen? A hacker? I’ve seen a T-shirt that says, “Stereotypes are a great time saver” and most of me was horrified, but I admit that part of me laughed. Few stereotypes come from absolutely nowhere, but a human being is so much more than a walking stereotype. Jolie can’t have grown up with the wealth and privilege she came from and not be affected by it. But she doesn’t want to be defined by that; she’s got ideas and aspirations that make her a unique person. Hauk can’t change his scars or the way people react to them, but he can decide what he’s going to do with his life now that he has them and move in that direction. That tension between where a person’s been and where he or she wants to be is what interests me. I like almost everyone I meet, and that piece—that struggle to get wherever it is someone’s going—is what I love most. I think we get a more accurate understanding of a person’s character if we look less at where they’ve been and more at where they’re going and how they’re choosing to get there. I try to write about people that come from all kinds of backgrounds but who have dreams they move toward, sometimes bumbling sometimes bravely, but (almost) always with integrity. Jax Garren is descended from Valkyries and Vikings (she’s part Swedish) but was raised a small town girl in the Texas Hill Country. 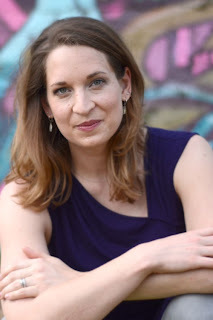 She graduated from The University of Texas with a degree in English and a minor in Latin and stayed in Austin to teach high school. During her eight years in public education she was in a riot, broke up fights, had cops storm her class with guns drawn…and met the most amazing young people who taught her more about life and hope than she taught them about any school subject. Jax believes in happily ever afters. She married her real life hero, a handsome engineer who is saving the world through clean energy technology. Her heroine is Marion Ravenwood from Raiders of the Lost Ark, the perfect blend of tough and feminine. Jax blames Marion for her dream of traveling to Nepal to experience Himalayan palaces and monasteries and to drink yak butter tea. Jax loves meeting new people, so if you see her out and about say hello! She’s always happy to raise a glass with her readers (or anyone else) in a toast to courage, adventure, and love.